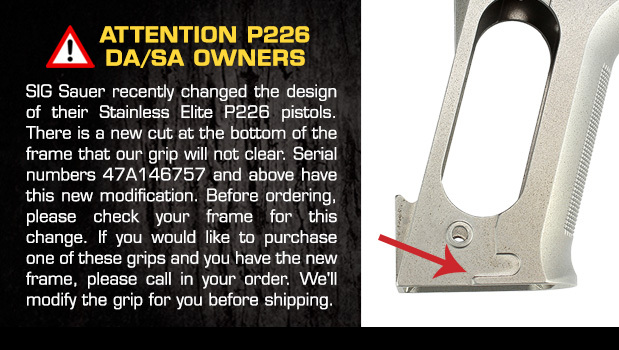 ENTIRE ORDER SHIPS FREE WITH PURCHASE: Hogue Sig Sauer P226 DA/SA Chain Link G-10 - Solid Black 26119. These grips are slimmer than the standard factory plastic or wood grips. Hogue grips will fit 226 E2. Remove the E2 grips to expose the screw holes. You must purchase grips screws in addition to the new grips. This retrofits the 226 E2 back to standard 226 grip dimensions. Will NOT fit new Legion series pistols. Will NOT fit new THE P226 Elite Stainless. P226 X-Five Allaround has its own set of grips.